The AirFit F20 for Her is designed to fit your lifestyle--featuring magnetic clips, a quick-release elbow and a simple design that makes it fast and easy to put on as well as clean and reassemble. InfinitySeal cushion is proven to fit 97% of all faces. 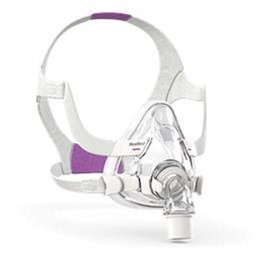 Quick-release elbow makes it simple to disconnect from the mask tubing without removing the mask. Plush headgear is specifically designed for extra softness and stability. Soft and flexible frame sits underneath the eyes and adapts to different facial types, while its integrated padding provides added softness. Magnetic clips guide the headgear to the frame quickly and easily.